With dozens of Chess books being published every year, these were the clues the potential buyer had to be familiar with. Reviewers have been out doing each other as to whom can castigate a book the best without invoking the wrath of a lawsuit. Some even seem to be inviting a battle in the courts. They not only slaughter the work but carry out personal attacks on the hapless author, the proof reader and even the people who the book was aimed at. So armed with a sack full of witty retorts and my computer keyboard sharpened and dipped in poison, I eagerly awaited my prey. You can imagine how disappointed I was to discover that WTWG is in fact a good Chess book. 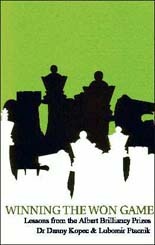 A very good Chess book. Before I continue, I must confess that I know one of the authors, Danny Kopec, very well. We actually wrote a book together, Master Chess, in 1985 (it received glowing reviews). 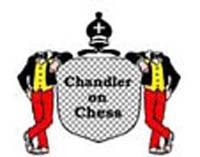 We played in the same team that won the Richardson Cup, the Chess equivalent of the F.A. Cup. In fact Danny was the captain and trainer of the team. Even so, all is fair in love and Chess book reviews. If I thought the book was hideous or appalling, two other words I have gleaned from recent reviews, then I would have waded in firing from both hips. So what sets this book apart from the rest of the fare that is offered to Chess players? Well it’s all down to a certain Paul M. Albert Jnr. You see, from 1984 to 2003 Mr Albert donated $2,000 to be awarded to the best games played in both the Women’s and Men’s U.S.A. Chess Championships. This book contains 64 brilliancy prize winning games. I also have to admit that the only brilliancy prize I won that satisfied the best defensive moves criterion was a bit of a swizzle. I thought I was losing and jumped into a 7 move sacrificial attack as an act of desperation. ‘… might as well go down with all guns blazing.’ It was only when my opponent played his 6th move I realised I was actually mating him. Such is Chess. I now quote Emmanuel Lasker, World Chess Champion 1894 -1921. ‘The hardest game to win is a won game.’ This only applies when good players are playing good players. When a Master has a won game against an amateur the result is never in doubt and the win will be trivial. A matter of technique. When Masters meet, the player who has the lost position will fight, wriggle, set traps, play desperate combinations, use all their experience to make things as difficult as they can for their opponent. So we have the bare score of the games. Do the authors do them justice? This is where Chess books stand or fall. There is no copyright on the moves of a game of Chess. Any Jack with an idea and a typewriter can visit any of the many Chess web sites and download millions – yes millions – of Chess games. They then cobble together a poorly researched, badly written Chess book full of mistakes and worst of all, bad advice. Having the bare score of a game, even a good game, still requires the annotator to explain the ideas and spot the mistakes. This is a skilful job and not all expert Chess players are good at it. In fact very few are. The big names usually earn their fee by writing a forward or having their name added as an author just to give the book some clout. A few years back a book appeared on the market called the King’s Gambit with Victor Korchnoi’s name on the cover. Time passed and in a collection of his best games, Korchnoi admitted that he put his name onto this book never having played the King’s Gambit in his life. To boost sales he played it a couple of times against selected opponents (weaker players). So once again you ask, do Kopec and Ftacnik do the games justice? Yes. The authors have taken these brilliant games, highlighted the instructive points and walked the reader through the analysis in a clear and enlightening manner. I can nit pick and say that game No.63 seems to be poorly annotated. Its lack of notes really stands out. But that is because the other 63 games are so well annotated. Perhaps it was lack of space and the authors were told to lose a few pages. Also, I have a slight quibble regarding the title. There is an excellent book out there called Simple Chess by Michael Stean. I often see it laying around in second hand shops. This really is a good Chess book but its title makes it look like a beginners’ book and it is thus ignored by the players it was aimed at. I always buy it and pass it onto a player who I know would benefit from it. One player I gave it to actually put a brown paper cover on it so people would not think he was reading a beginners’ book. This is true. His name was Alastair Macintosh. But these are minor points. In a nutshell: Winning the Won Game is an excellent Chess book and highly recommended. That’s the trouble with good Chess books, there is not much else to say. Winning the Won Game is available from Batsford, priced £13.99 PBK, ISBN 0-7134-8900-6.